Wire Swaging – We swage wire sizes from 3/32″ up to 3/8″ on our bench mounted rotary swaging machine. We stock wire sizes up to ¼” and make lifelines, all types of standing rigging for all boats from one-design dinghy shrouds to replacement rigging for cruising boats. We offer competitive pricing and quick turnaround service in case of emergencies. 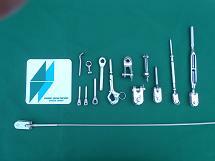 We carry a complete inventory of turnbuckles, marine eyes, swage forks, double jaw toggles, eye to jaw toggles, T fittings and lifeline hardware. We also specialize in making all types of sheets and halyards from custom tapered high tech halyards for racing to double braid Dacron halyards for cruising boats.